Article submitted by Gudelia Guerra, RC consecrated and Challenge leader. Challenge and ECYD in the Philippines is always an adventure! We currently have Challenge at three schools, De La Salle Zobel, Everest Academy, and Mano Amiga. These clubs are run by the consecrated, missionaries, team leaders, and very supportive parents. Challenge in the Philippines is just like any other Challenge group around the world, but at the same time it is very unique and true to the culture here. The Philippines is truly an amazing place to have Challenge because of the culture of faith that is prevalent in the society. Also, there are a lot of our brothers and sisters in the country who are extremely underprivileged and that creates room for service, generosity and humility, which is what we aim to teach our girls – to serve, give and love as Jesus did. It helps the girls realize exactly how blessed they are and it gives them a new perspective in life. Common outreaches include visits to orphanages such as Holy Family Homes and White Cross, schools like Mano Amiga, and even public hospitals such as the Philippine General Hospital, where the girls are able to take all the faith, formation and gifts they have been blessed with and share it with those around them. Unique to the Philippines’ Challenge group activities are special occasions such as Yaya Appreciation Day. “Yaya” is the term used in the Philippines for “nanny”. 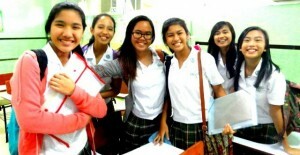 Once a year, the Challenge girls allocate a day wherein they give back to their yayas who take such good care of them. They plan the entire day as a treat for their yayas. 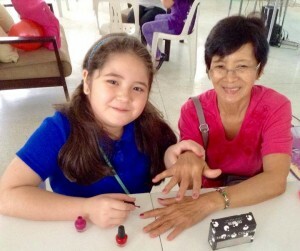 Last year, the girls treated their yayas to a mini spa – they gave them manicures and massages, and even performed for them. B etty Napkil, long time member and now Team Leader of Challenge in Everest Academy Manila, says “I have been so blessed to have been able to grow up with Challenge. I’ve been a member since I was 8 years old, so some of the consecrated and other members have really seen me grow and have had a really profound impact on my formation. They’re people as familiar whom I can always turn to, and I am so so grateful for that”. She is just one of many who have had the amazing experience of being a part of the community growing up and has become a team leader to share this experience with younger generations. Challenge Philippines has truly changed the lives of everyone who has experienced it – either as someone who’s been visited by Challenge, or as a member or team leader – Challenge has brought Jesus into their everyday lives and it has changed them for the better.